Have you heard of the Row by Row Experience? From the description on their website, "It's like a shop hop, but it's not... no fees, no cards to stamp, and all summer to play! Simply visit any of the participating shops and receive a free pattern for a row in a quilt. Combine your rows in any way to create a unique quilt that represents the fun you had traveling throughout the summer. 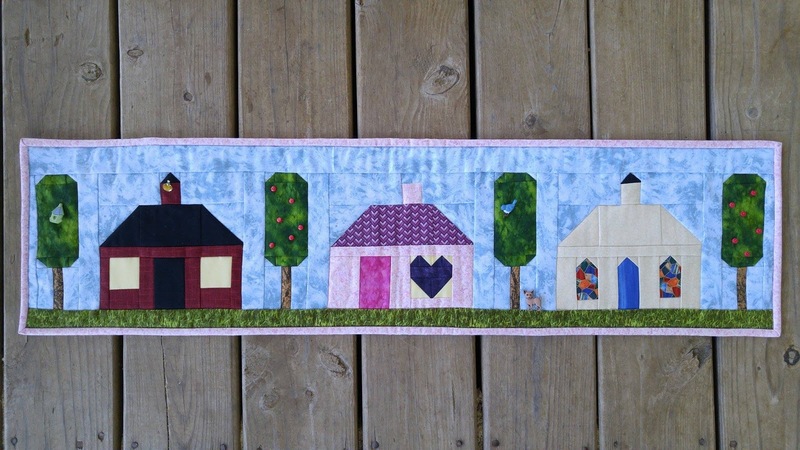 Travel with friends, discover new quilt shops and have fun collecting rows!" And there are prizes too! Be sure to go to their website to read more about it! There are shops that participate all over the US, Canada, and Europe! Check out the list of participating shops to find one near you! 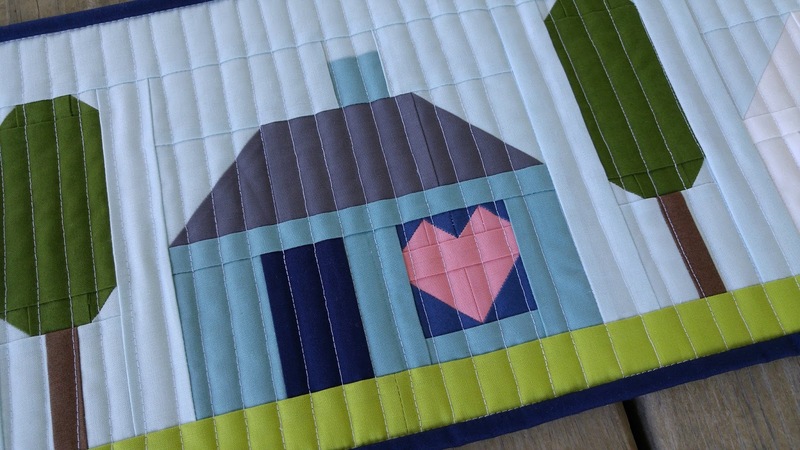 This year, the theme for all the rows is "Home Sweet Home." 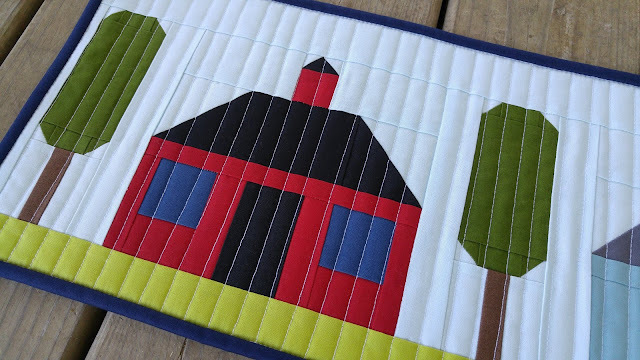 Each participating shop has a unique pattern that you can only get by visiting the shop in person. 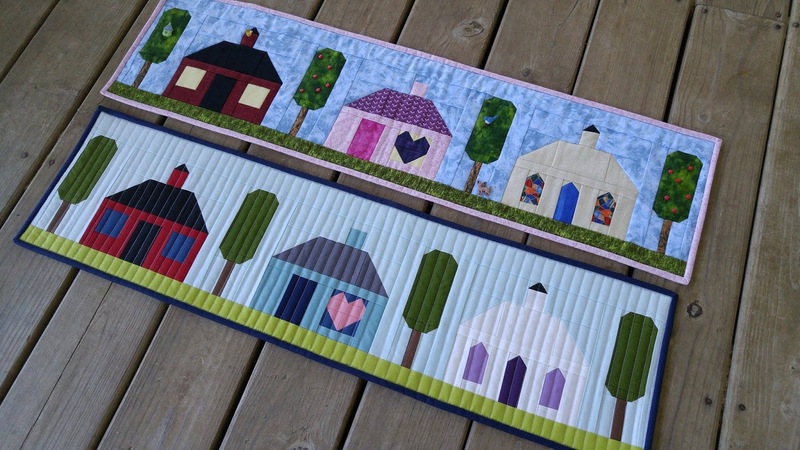 The patterns are FREE, but many shops sell a kit to recreate their sample row. 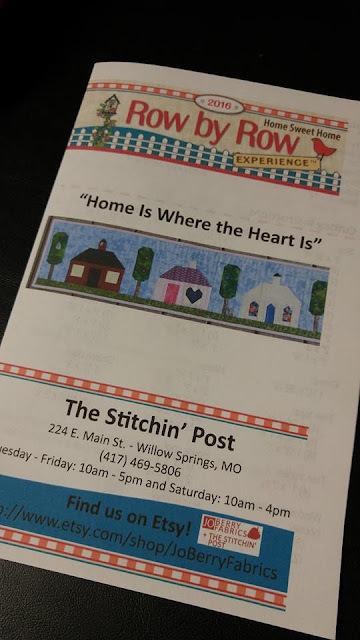 Joan Pierce is the owner of my favorite local quilt shop, The Stitchin' Post in Willow Springs, Missouri. 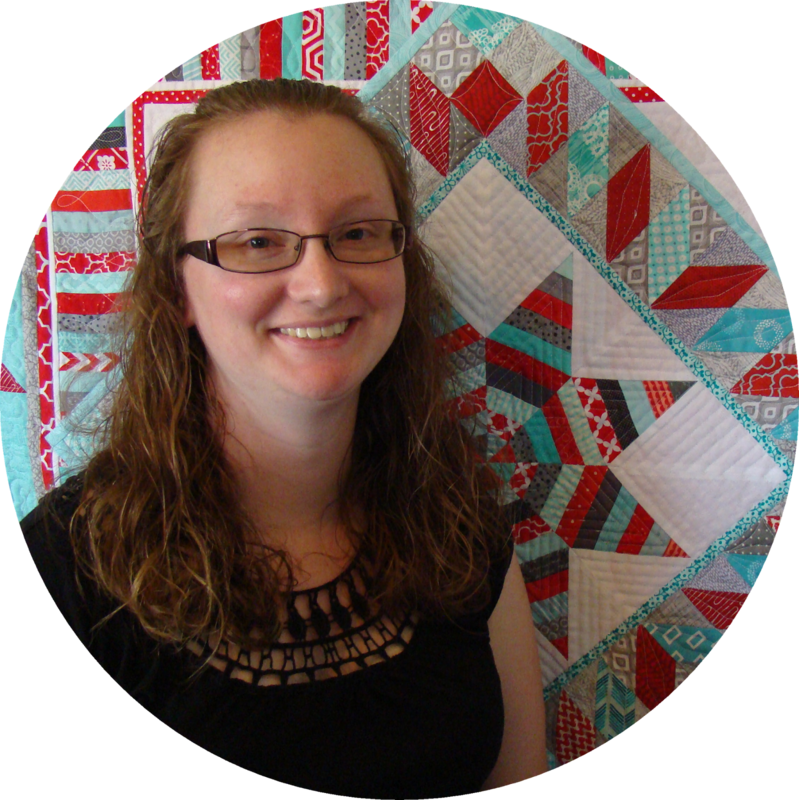 (They sell some fabrics on etsy too!) 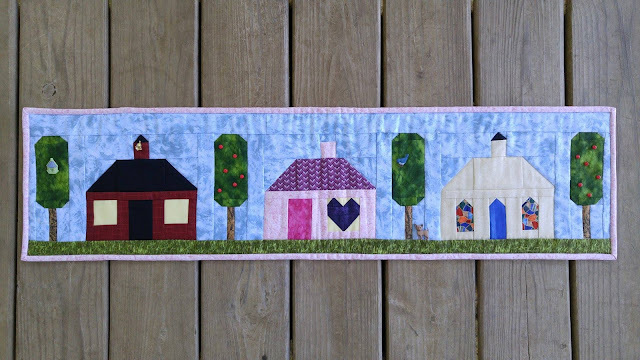 During the spring shop hop, she asked if I'd be interested in designing the row for their shop! Of course I jumped at the opportunity! 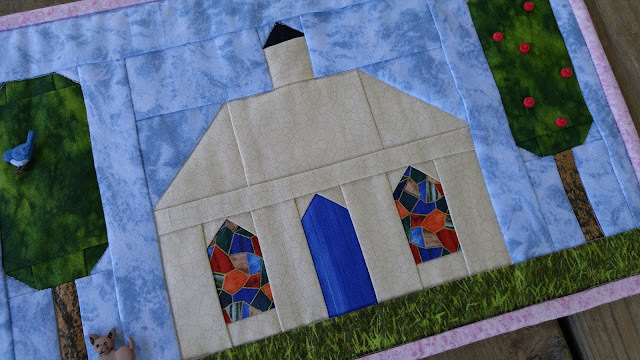 In our initial conversation, Joan mentioned she wanted some trees, a house, and a church. I immediately drew up a rough draft to send her. We made a few changes, and decided on a final design! 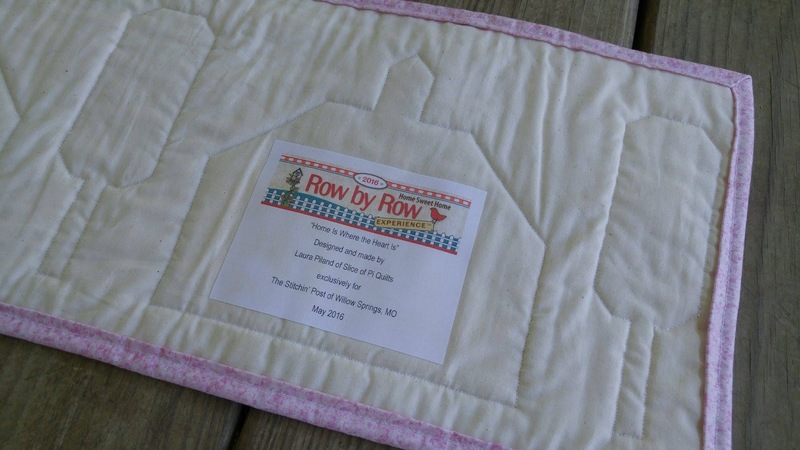 The row is titled, "Home Is Where the Heart Is." Joan picked out all the fabrics (which will be available to purchase in a kit!). She is also including several buttons in the kit. There's a birdhouse, bird, dog, bell, and tiny red buttons for apples. I think it makes a great table runner! I also wanted to sew one up in more modern fabrics. 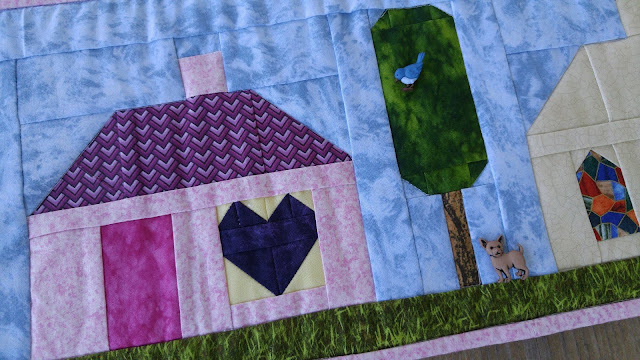 This one is made with mostly RJR Fabrics Cotton Supreme solids. 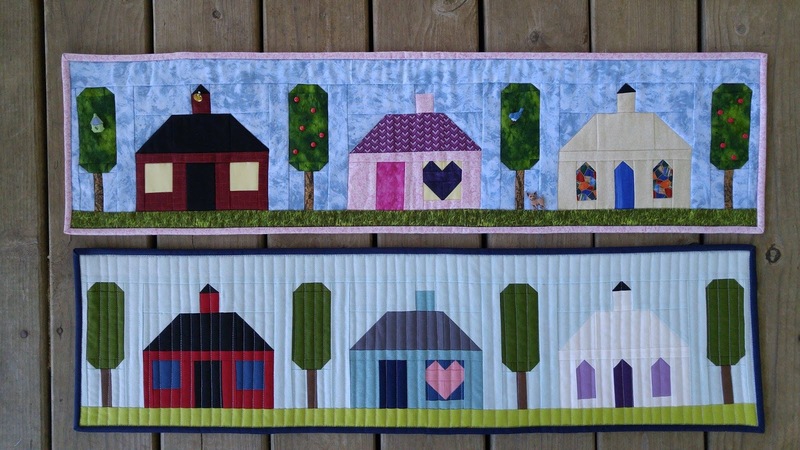 I'm always fascinated with how different a quilt looks with different fabrics! 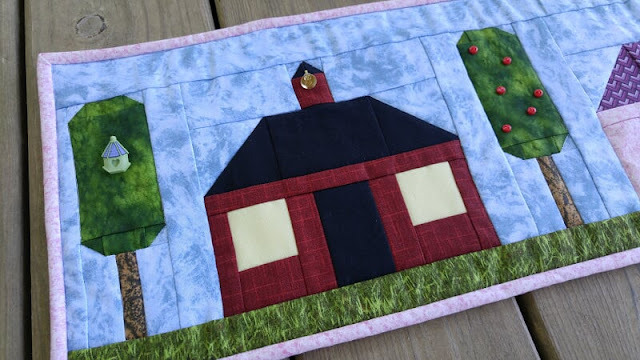 When I mentioned to my mom that I was going to make a more modern one with solid fabrics, she said, "Oh, like the Amish!" 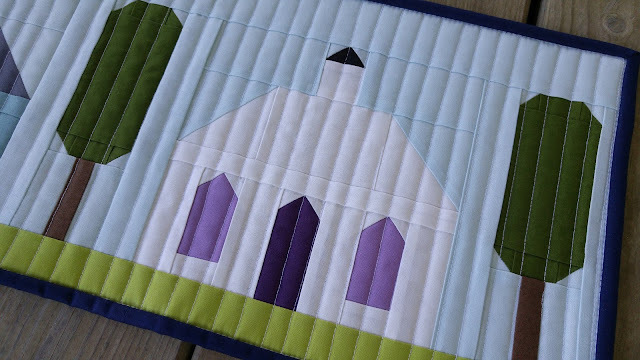 Well, I used solids in black, green, red, blue, and purple. No yellow or orange. And white. So, "modern?" "Amish?" Either way, I like it! 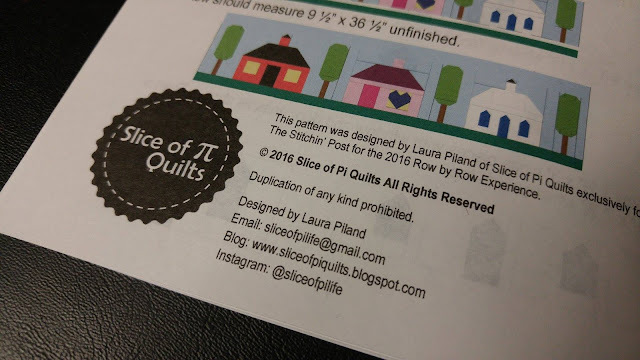 I'm so excited to see my pattern printed up and available at a quilt shop! I hope you're able to stop into The Stitchin' Post this summer (June 21st through September 6th) to pick up my pattern! The shop is located at 224 E. Main St. in Willow Springs, MO. They are open Tuesday - Friday 10am - 5pm and Saturday 10am - 4pm. 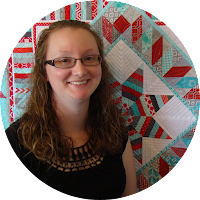 I can't wait to see the pattern sewn up by other quilters! Laura, you have out done yourself. 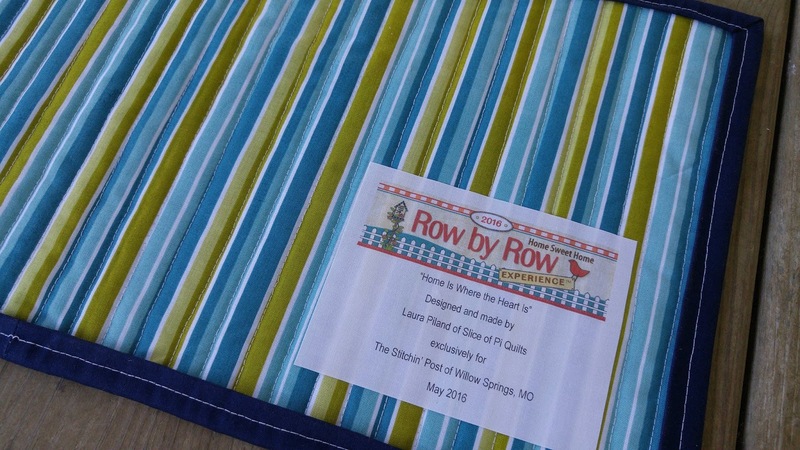 Thank you so much for the beautiful job you have done with The Stitichin' Post's ROW BY ROW for 2016. We also have our 2016 License Plate (WILLOW STITCHIN')for SALE at $5.95 each.